This painting is one of my favorite works. A few years ago I would “keep” my brother’s farm in Horsepasture, Va. while he and his wife were away at fiber festivals. They raised sheep and my sister-in-law was, or rather, is a guru when it comes to anything to do with wool and other fibers. She taught workshops in spinning, weaving, dying yarns, and knitting. I would watch over their small herd of sheep while house sitting. I soon looked forward to seeing them on each visit to the farm and realized I had made a needed connection with these grazing animals. They would come to greet me when I approached the gate to the paddock and seemed to be saying “Greetings, friend”. 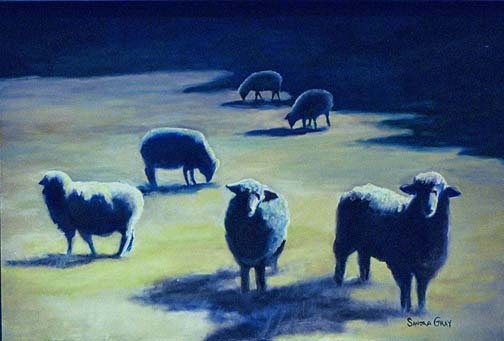 This painting was done from a snapshot of some friendly lambs and sheep from other snapshots were used in the composition. The snapshots had strong shadows and I kept them because I liked doing a composition using the glare of backlighting. ~ by Sandra Lynn Gray on June 24, 2007. Definitely one of my all-time favorites – it should have a comment.